thandor.net - article - A tune up; a few bits. A tune up; a few bits. Because I have little history about the car I don't know the age of parts like spark plugs. In order to maintain the car and be on the safe side I replaced all the spark plugs. The old ones looked good indicating the engine runs fine. The rear wheel on the passengers side had a little squeek noise. Cleaning it out and re-adjusting the brakes did the trick. Comma advises to change the 20W50 classic oil each 2000 to 3000 miles. Because I did about 2000 miles since I've bought the car and I didn't know the age of the current oil, I refreshed it all. The fan belt was old and worn out. The new T24403 fan belt works great! In order to install it I lifted the engine up and slid the belt onto the pulley. An other option is to remove the water pump, a job that should be done in the future because the bearings start to wear out. I also installed a new thermostat. 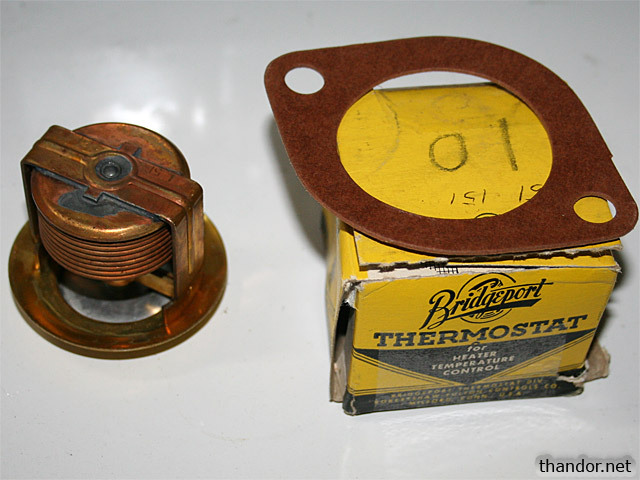 My car always ran too cool and it turned out it didn't have a thermostat at all. It's has probably been removed in the past and never replaced.